The 2017 NFL season saw plenty of first-year players take the league by storm. 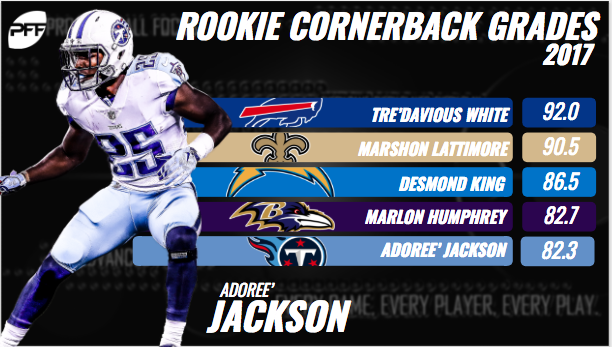 Whether it was Kareem Hunt’s breakout season in Kansas City in which he led the league in missed tackles forced or whether it was the battle between Marshon Lattimore and Tre’Davious White at cornerback to win PFF’s Defensive Rookie of the Year, the 2017 NFL Draft class was something special. That being said, this draft class may be even better than anticipated as injury cut short some promising seasons and others we’ve only seen a glimpse of to start their careers. Here are eight players, entering their second years in the league, who could break out for sustained success in 2018. The hype train that followed the big-armed Patrick Mahomes to Kansas City barreled down the tracks full speed as soon as the Chiefs pulled the trigger on him at No. 10 overall in the 2017 NFL Draft. Now, with all road blocks (Alex Smith) removed, Mahomes is in a position to live up to such high expectations. Mahomes did start one NFL game in 2017, where he completed 22-of-35 passes for 284 yards and one interception en route to a 79.9 overall game grade. But, given the limited sample size, his college production may be more telling of his future than his lone start. Among draft-eligible quarterbacks in 2017, Mahomes ranked fifth in adjusted completion percentage (75.4) and second in adjusted completion percentage (82.9) and passer rating from a clean pocket (125.5) his final year at Texas Tech. Cast at the helm of head coach Andy Reid’s detailed offense, Mahomes will be in a position to succeed, especially with such a strong supporting cast in Travis Kelce, Tyreek Hill and Kareem Hunt. Of course, it’ll be in his hands to take advantage of the situation. Minnesota Vikings rookie running back Dalvin Cook, a 2017 second-round pick and former star at Florida State, put together an outstanding rookie campaign, flashing the elite short-area quickness and elusiveness that propped him up so high in Tallahassee. Of course, Cook’s dominant NFL debut was short lived, as a non-contact knee injury in Week 4 cost him his season and ultimately delayed his breakout. The 5-foot-11, 213-pound Cook fit in right away as a three-down back in the Vikings’ backfield, totaling 85 touches across 169 offensive snaps. He ranked eighth in yards after contact per attempt (2.6) and tied for second in total forced missed tackles (18) among the 27 running backs with at least 50 touches in Weeks 1-4, leading to 444 total scrimmage yards. His 5.22 yards per touch ranked fifth among the same group of backs. 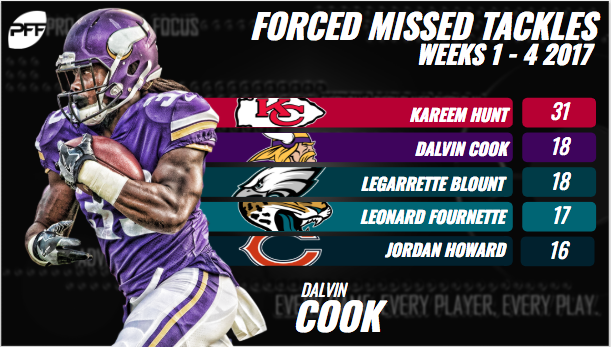 If his health permits, Cook will likely receive a similar touch count as Minnesota’s go-to back in 2018, if not an even further increased workload with Jerick McKinnon now with the San Francisco 49ers. If he can return to his opening season form 2017, he’ll be in line for a handful of NFL honors come the end of next season. 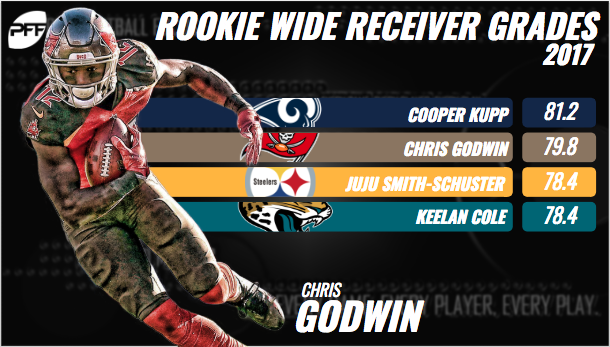 Tampa Bay Buccaneers’ third-round pick Chris Godwin had little opportunity to push for reps ahead of veteran wide receivers Mike Evans and DeSean Jackson in 2017, leading to a limited role for the former Penn State product for most of his rookie season. However, when opportunity struck, Godwin took full advantage. Though he played in just 41.0 percent (446/1,088) of the team’s offensive snaps, Godwin proved efficient with his route running, as he ranked 13th in yards per route run (2.03) among wide receivers with at least 41 targets in 2017. Godwin also earned an 82.0-plus overall game grade in three of the four contests in which he logged at least 40 offensive snaps in last season, and his lone down performance only rendered a 73.0 overall grade. Godwin will still have his work laid out for him in terms of earning play time with both Evans and Jackson expected to reclaim starting roles in 2018, but he’ll still garner some targets in a reserve role and even more so if he can hone his skillset in the slot and take snaps away from veteran Adam Humphries. As Tampa Bay’s primary slot receiver in 2017, Humphries earned a career-low 67.8 overall grade. Filling in for the oft-injured veteran Cordy Glenn sporadically throughout the season, Buffalo Bills rookie offensive tackle Dion Dawkins performed well through 853 offensive snaps at left tackle in 2017, giving the team’s brass enough confidence to move on from Glenn in favor of Dawkins in 2018. After a shaky start to the season, Dawkins turned the corner when awarded the luxury of continuity as the go-to starter at left tackle from Week 10 through the team’s playoff loss to the Jacksonville Jaguars. In the span of nine games, Dawkins allowed 22 total pressures (20 hurries, two quarterback hits) across 331 pass-blocking snaps, which was good for the second-highest pass-blocking efficiency (95.0) among rookie offensive tackles with at least 130 pass-blocking snaps in that timeframe. He also finished the season with the 20th-ranked run-block grade among all qualifying offensive tackles in 2017. Dawkins still needs to develop his sklillset this offseason to emerge as a top-10 tackle in this league, but if his rookie season was any indication, such status is within reach for the former Temple standout. After playing at least 400 defensive snaps in his final three years at ‘Bama, Washington Redskins interior defensive lineman Jonathan Allen suffered a season-ending Lisfranc injury just 159 snaps into his NFL career. Adding insult to injury, Allen had been amidst a three-game tear of opposing offensive linemen when his misfortune struck. In the three games prior to injury (Weeks 3, 4 & 6), Allen recorded 11 total pressures and five defensive stops, the former of which tied him for seventh among all interior defenders. He also earned 79.3-plus overall grades in all three contests. Allen has all of the tools necessary to develop into one of the better interior defenders in the NFL if he’s able to stay healthy, especially when given the opportunity to start in Washington’s talent-rich trenches with Matt Ioannidis, Ryan Kerrigan and Preston Smith. 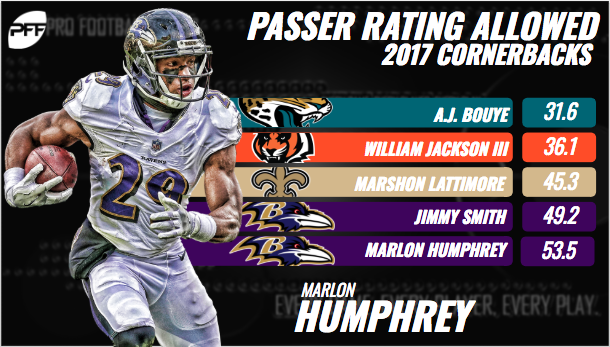 Hidden within a depth role to start the 2017 season, Baltimore Ravens cornerback Marlon Humphrey played just 34.6 percent (208/601) of the team’s defensive snaps in Weeks 1-9, earning an 81.0 overall grade in said span. The Ravens’ coaching staff then rewarded Humphrey in the form of a starting nod following their bye in Week 10 and the former first-round pick didn’t fail to impress. Due in large part to his strong finish, Humphrey is expected to reclaim his starting role opposite of veteran Jimmy Smith at outside cornerback, setting the stage for a breakout year in 2018. Unlike the Ravens’ handling of Humphrey, the Tennessee Titans took a trial-by-fire approach with first-round cornerback Adoree’ Jackson, playing him on 94.1 percent of the team’s defensive snaps throughout the 2017 season. And, to the Titans’ credit, Jackson rose to the occasion, improving with each start and finishing among the league’s best at the positon. After earning a 71.4 overall grade through his first 506 defensive snaps (Weeks 1-9), Jackson improved his overall grade by 10.9 grade points over the course of his final 10 games (including two postseason appearances) to finish the 2017 season at 82.3. And his upward trend should only continue when he reclaims his starting role in 2018. Battling a lingering hamstring issue through the first 12 weeks of his rookie season, Dallas Cowboys cornerback Chidobe Awuzie either wasn’t himself or wasn’t on the field prior to the final five games of the season. Awuzie, however, flashed star-level potential when healthy down the stretch. The former Colorado product played a whopping 252 defensive snaps, 92 percent of which at left outside cornerback, in Dallas’ final five regular season contests after playing just 57 snaps in their first 11 games. Awuzie allowed just 6.9 yards per reception allowed, ranking fifth among cornerbacks with at least 10 receptions allowed in said span. He also earned 81.0 overall game grades in three of the five games. 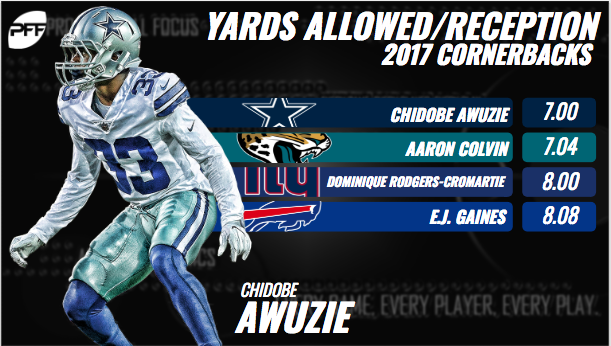 Expected to assume the starting nod at left outside cornerback in 2018, Awuzie will have an opportunity to place his name among the league’s best boundary cornerbacks if able to repeat his 2017 successes and stay healthy for the entirety of his sophomore campaign. *Overall grade did not qualify for a rank in 2017 due to low snap count total.